Chef Jet offers Travis the most practical tips in cooking with beer, wine, and spirits. Keep in mind that you should never cook with a beverage you wouldn’t want to drink. Al is part of an unlikely group of three local restaurant critics who dominate the Las Vegas restaurant review scene. The other two members of this exclusive trio are the scholarly Max Jacobson who reviews for Vegas Seven and John Curtas, esq., a practicing attorney. Over three years ago Al Mancini came up with the idea of penning the definitive guidebook to the 50 essential restaurants in Las Vegas. The thought was that it would be updated annually. Al brought in fellow critics Max and John to add diversity to the selection process and sold the idea to Huntington Press in Las Vegas. For a restaurant to make it into the “50 essential” all three critics must agree. This is where the fun starts because the three seldom agree on anything! One of the highlights of the book is the list in the back of restaurants that didn’t make it because of a veto. You have the explanation from the nominator about why it was included and then the thumbs down from the critic who disagreed. Also in the book is a useful section on where to get specific food items. For instance there are helpful listings for beer, buffets, burgers, pizza, steakhouses, Sunday Brunch, and sushi. 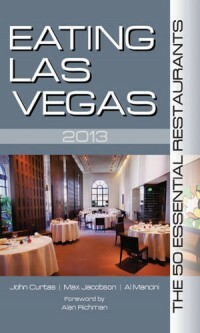 Eating Las Vegas : The 50 Essential Restaurants is now in its 3rd Edition. It’s a value @ $12.95.